When the clouds above the slopes of Mt. Kinabalu began to sour, and the first drops of rain fell on our heads, my trek companion – who had nothing in the way of science to support his optimism – was quick to say that the weather would immediately improve. I checked my watch briefly and I regretfully announced that his prediction was not going to happen. No, my watch had little to do with prophesying events, nor was it involved in any of the esoteric arts; rather, in that tiny machine strapped to my wrist was a weather station. I didn’t predict what was about to happen, but merely provided a forecast based on the weather trend in the last three hours. In my recent trek to Mt. Kinabalu, I was equipped with a Suunto Core Light Green: a handsome new addition to the Finnish company’s impressive line of outdoor wrist-top computers. The Suunto Core has six different models available, and I was loaned the Light Green which sports retro-glam styling on the outside that most definitely betrayed its myriad of functions inside. The minute I strapped the Core Light Green, I was immediately smitten by its looks; and my friends seemed to agree as nearly all of took notice of the watch within a few minutes. The Core Light Green has an oversized but minimalist digital display surrounded by a rotating bezel with fine texture details that almost resemble shiny studs. Its plastic strap has a series of slots, which, beyond just being a design element, pare down weight. Wearing it is almost the same as not wearing it – it’s so lightweight that it is as if it’s not there. But while it’s been trimmed down and styled, the Core Light Green packs in the pounds that hard-to-the-core outdoor enthusiasts will be just as easily seduced as young urban professionals. And it is so cleverly-designed that it successfully does away with all the clunky, chunky, busy buttons that ail most of its competitors, without sacrificing functionality as well as its easy-to-understand interface. Admittedly, one might not be able to make full use of its features without reading the manual, but this shouldn’t be much of a chore since there are only a few pages to skim through. 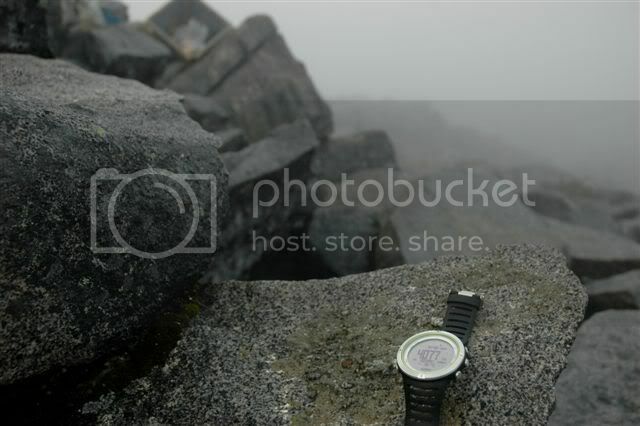 So beyond just telling time, the Suunto Core also indicates altitude, depth, air pressure, temperature, and true north. For most people, these might not have any appeal at all because beyond zooming up and down buildings on an elevator, or listening to the weather forecast in the evening news, or adjusting the thermostat in the office, all the information that may be provided by the watch is easily accessible, or sometimes downright trivial. But for weekend warriors who may actually find themselves beyond the reach of technology, the Suunto Core offers utility beyond compare. Like most multi-function wristwatches, the Suunto Core gives approximate altitude measurements based on changes in absolute air pressure; a reference is fixed at a given (or known) altitude, and any drop in air pressure is interpreted as an increase in altitude. What this means is that, first, the reference altitude (or air pressure) needs to be adjusted from time to time (it is best to do this at sea level), because high-speed elevators and airplane flights will confuse the built-in altimeter and barometer. And second, the measurements are merely indicative, and shouldn’t be made the basis in determining the precise height of any given mountain. Against real-world conditions, the Core Light Green’s altimeter provided accurate readings, given the limitations. I fixed the altitude at the start of my trek up Mt. Kinabalu, and provided my trek companions with assurances about how much we’ve achieved (and how much more we would have to toil) in terms of vertical distance. In this sense, the altimeter, though off by a few meters, gave us a sense of place. In the sport of mountaineering, expectations play a huge part in a tiring day when the trek drags on for many hours up steep slopes. This way, you can budget your energy, and pour the last iota of your strength to get to the campsite, or in the case of Mt. Kinabalu, the Laban Rata dormitory. And while waiting for the sun to rise at the summit of Southeast Asia’s highest peak at a little after 5am, I noticed that my reading was less than 15 meters off the actual height of the mountain – this was an acceptable difference, since I certainly was not expecting laser precision, and because I wasn’t keen on lugging along a GPS devise. The wait was taking a little long and we were beginning to shiver violently, so I was asked what the temperature was. I took off the Suunto Core (body temperature tends to influence the temperature reading) and after a few minutes, it informed me that we were close to freezing (3 degrees Centigrade!). The Suunto Core also has other functions which might be the envy of other watches in its category. It is equipped with a storm alarm, and gives a series of beeps if the air pressure continues its downtrend in the last three hours. Another useful function of the Suunto Core, among its many others not all of which will get mentioned in this review, is its sunrise/sunset database of key cities around the world. It makes for snappy conversations such as the one I had with a friend while walking around in Kuala Lumpur. I told my friend that we were scheduled to meet someone at 7pm. “But it isn’t even sunset yet!” my friend replied, obviously losing track of time. I said that the sun doesn’t set until 7:28pm. “Did you just come up with that?” he asked. And I said “No, my watch tells me so.” True enough, we still had ample light at half past 6 in the evening. And the best part about the Suunto Core Light Green is that it seamlessly makes its transition from a hard-core outdoor devise to a preppy yet sporty-looking watch. I came down the mountain, took off my dog tag, and peeled off my ready-for-battle trekking gear. But the watch remained on my wrist. Since a watch is possibly the only accessory I get to wear these days, I was glad that I got to sample the Suunto Core Light Green, even for just a short time. And I can’t wait to own one.